Leading haptic technology company receives highest national accolade recognising its unique technology and commitment to continued innovation. 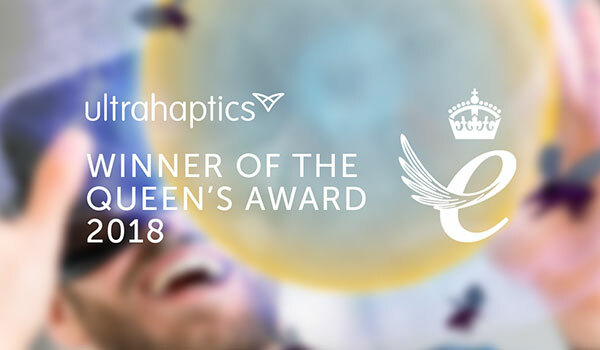 April 21st 2018 – Ultrahaptics today announced Her Majesty The Queen has granted the company the Queen’s Award for Enterprise in the Innovation category. Ultrahaptics’ unique technology uses ultrasound to project the tactile sensations through the air onto a user’s hands, enabling them to ‘feel’ virtual buttons, get touch feedback for mid-air gestures, and interact with virtual objects. The company deploys the technology in a range of applications; from automotive infotainment systems, to immersive experiences in augmented and virtual reality environments. Global brands, including many household names such as Bosch, Dell, and Nike, have used the technology to develop public demonstrations and products showcasing the future of human-machine interaction. The Award recognises not only the innovative nature of the core technology, but also the team’s commitment to ongoing innovation. The company runs an ‘Academic Program’ which has subscribed over 45 Universities worldwide, including MIT, University of Oxford and University of Tokyo. The Program gives academic teams easy access to the technology so that they may develop the field of haptics research, which refers to the sensation of touch. Now in its 52nd year, the Queen’s Awards for Enterprise are the most prestigious business awards in the country, with winning businesses able to use the esteemed Queen’s Awards emblem for the next five years. Ultrahaptics will celebrate its award during a royal reception for Queen’s Awards winners in the summer.